The Federal Highway Administration recently released a new “workbook” designed to illustrate 13 strategies that have been successfully used to accelerate “multimodal” projects. The agency said its Strategies for Accelerating Multimodal Project Delivery workbook is designed to address the “growing demand for an integrated transportation network” while recognizing that motorists, freight, transit passengers, bicyclists, and pedestrians – including individuals with disabilities – all have “unique” transportation infrastructure that can “challenge and delay” projects as they are adapted to the growing “multimodal” nature of travel. 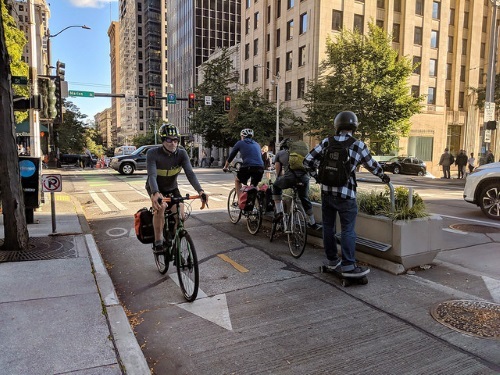 For the purposes of this publication, the term “multimodal” encompasses the broadest mix of transportation modes: from roads and rails to bike paths and pedestrian walkways. “The primary intent of this workbook is to focus on specific strategies and techniques for accelerating multimodal project delivery, including where there are opportunities to efficiently and effectively build out connected multimodal networks in concert with major highway, intersection, and bridge projects,” FHWA explained to the AASHTO Journal in an email. “The workbook will help state DOTs by identifying common barriers and issues, [while] documenting accomplishments states have achieved in the project delivery process,” the agency added. “FHWA sought to get experiential knowledge from a cross-section of agencies involved in project development at the federal, state, regional and local levels, including both headquarters and division staffs at state DOTs,” the agency noted. “In essence, the workbook serves as a guide for transportation practitioners interested in accelerating delivery of multimodal projects based on the resources available and includes case studies that provide information on how agencies have successfully accelerated multimodal project delivery,” FHWA said. To that end, as a complement to the workbook, the Center for Environmental Excellence by the American Association of State Highway and Transportation Officials recently released two new case studies: Connecticut DOT Helps Towns Accommodate Walking and Bicycling through Road Safety Audits and PennDOT Seeks Local Input to Build Better Connections for Communities.